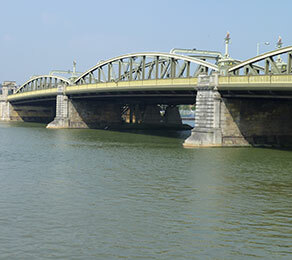 Based on its knowledge and expertise in the area of bridge bearings, CCL was commissioned to inspect the original roller and fixed bearings, installed in 1914, on the Rochester Old Bridge, a Victorian bridge in bowstring arch style. CCL’s main objective was to inspect the mechanical movement areas of the bearings, which necessitated the removal of protective steel casings and grease. To gain access along the piers CCL was required to provide a safe rope access system. Thereafter a cleaning operation was carried out to allow inspection. This was a demanding operation in extremely restricted conditions, requiring CCL engineers to undergo confined space entry training. The investigative process involved the inspection of areas of stress, corrosion and defective paint coating, together with measurements of bearing offsets. The condition of the expansion joints and waterproofing system was also examined. Poor visibility and difficult access called for the installation of festoon lighting throughout the bridge. By using an endoscopic camera, CCL was able to report on the condition of the expansion joints between the deck ends and the bearing locations. CCL’s comprehensive report provided full written and photographic references, sketches and recommendations for future maintenance and monitoring of the bearings.